The Question: What has the Ethics to do with the Declaration? As the subtitle indicates, we are to examine whether or not Aristotle spoke to the founding generation. Sadly, I must be rather blunt: Aristotle had almost no direct influence on the Founding or the founding generation. And, when he did speak to them, he spoke through his logic and rhetoric first, his politics, second, and his Ethics almost certainly not at all. This is not in any way to suggest that the ancients had nothing to say to the Founders. They had quite a bit to say, and the Founders had quite a bit to hear. Looking to the ancient world, through the eyes of a Christianized and reformed Europe, the founders overall desired a the purification of what they inherited: the western or European (Anglo-Saxon-Celtic, but larger as well) common wealth—a republic rooted in right reason, first principles, and the Natural Law. 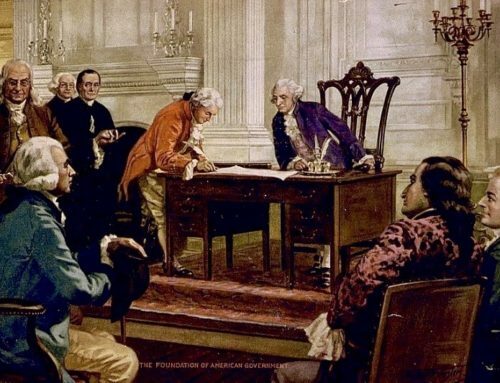 As most Americans understood Providence in the eighteenth century, God had written the republican principles of the American drive for independence into nature herself. “We do not by declarations change the nature of things, or create new truths, but we give existence, or at least establish in the minds of the people truths and principles which they might never have thought of, or soon forgot. 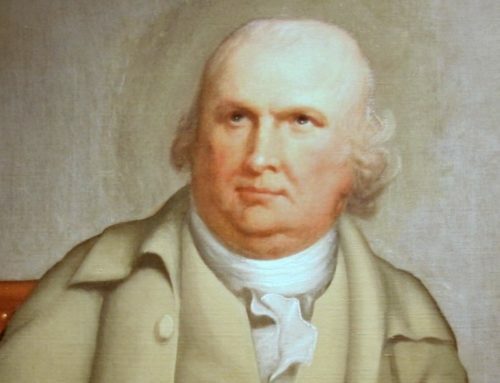 If a nation means its systems, religious or political, shall have duration, it ought to recognize the leading principles of them in the front page of every family book,” a leading Anti-Federalist wrote in the aftermath of the war for Independence. Unlike today, the world of antiquity spoke volumes to the Americans of the 18th and early nineteenth centuries, with figures such as Cicero especially guiding gently by commands, encouragements, and prohibitions. And, we can think of more tangible examples. The U.S. Capitol is a Roman Republican building—it is not patterned after the Hanging Gardens, or the Taj Mahol, or the Mayan Pyramids, or English Parliament, but after the architecture of the Roman Republic ; the employment of the term “Senate” (from Latin—“old man”); of Congress (probably from Latin for “come together”, but might be related to Anglo-Saxon “witan”); and the Fasces (Latin for “bundle”). There are at least 56 separate entries regarding classical and medieval history/republics/persons/events. John Locke is never quoted, mentioned, or even alluded to. There is only one reference to Declaration of Independence, and it is a poetic reference rather than a philosophical one. There are also no direct or indirect references to Aristotle’s works, though Aristotle’s name appears next to that of Cicero’s and Polybius’s in Madison’s personal notes for Federalist 63 on the notion of the Senate. Most Americans, though, lived and breathed the air of antiquity, and it spoke to them—as a whole—in ways they themselves might not have overtly recognized: in the naming of children (Homer, Virgil, and Narcissa were common names, especially in the South); in the architectural styles of homes and public buildings (our area in Michigan is full of Greek Revival); and in the establishment of towns (Homer, Romulus, Remus, etc.). Until the 1870s, most Americans assumed that education was liberal education. If not liberal, it wasn’t education, it was training. Though the American Founding (though we could easily make an argument there was either no founding or many, many foundings) was a return—purified, reformed, Christianized, and mythologized—to antiquity, it was most certainly a reawakening and return, nonetheless. This does not mean, however, that Aristotle was an important part of this return, unless we want to consider Aristotle only as a symbolic representation of antiquity. Even then, we would do far better to pick a Roman figure—such as Cicero (the single most important figures in antiquity for the Founding generation), Virgil, Livy, or Tacitus. Never cited once in the three month-long constitutional convention. Never cited in The Federalist Papers. Never cited in Dickinson’s Letters of a Pennsylvania Farmer (though, JD loves Antigone), the most widely read piece of revolutionary literature until the printing of Paine’s Common Sense). Never cited in any of George Washington’s letters or speeches (except in mentioning the ordering of a bust of Aristotle, along with a significant number of other classical figures. Never cited in the complete works of Alexander Hamilton. Never cited in the first history written of the American Revolution by David Ramsey in 1789 or in the second history by Mercy Otis Warren in 1805. In the works and correspondence of Thomas Jefferson, we find Aristotle’s name appearing only a few times. In a letter to Benjamin Waterhouse, he dismissed Plato and Aristotle as “mystics” who give ammunition to priests to corrupt religion. In the most authoritative study on the sources of the Founding, Professor Donald Lutz quantifies the references made to various sources, ca. 1761 to 1802. During that time, he found 36 widely cited authors: including St. Paul, Montesquieu, Blackstone, Locke, and Hume, and Plutarch as the top 6. Cicero is #12, Livy #21, Tacitus #24, and Plato #25. Aristotle does not even make the list. This, however, is not to suggest that the founders did not absorb the teachings of Aristotle—they did, but secondarily through the works of Machiavelli, Bacon, Sidney, Harrington, Locke, and Montesquieu. Many American students also learned the art of rhetoric, in part, from Aristotle. Additionally, many in the Founding assumed that Aristotle’s greatest role was the tempering of the excesses of his supposed pupil, Alexander the Great. In attendance at his lectures: President George Washington; Vice President John Adams; and Secretary of State, Thomas Jefferson. While the Founders believed in “happiness” and derived much of their belief from seventeenth-century political philosophy, the average American derived his notion of it from Martin Luther, St. Paul, and colonial experience. In preparation for their time at HC, the freshman were asked to read Brookheiser’s Founding Father as well as Aristotle’s Ethics. Wisely, Brookheiser never tries to tie the Founding Father to Aristotle (he’s only mentioned once in the biography, and then only in passing). Instead, Brookheiser rightly claims the Stoics and Roman republicans spoke most clearly to Washington. Our first president is, after all, not the American Aristotle, but the “American Cincinnatus,” the ultimate Roman Republican, and the “American Aeneas,” the ultimate antique bearer of truth. Juba: Hast thou not heard/Of my false countrymen? Cato: Alas! Young prince/Falsehood and fraud shoot up in every soil,/The product of all climes—Rome has its Caesars. None of what I state this afternoon is meant to be a dismissal or diminution of either Aristotle or Washington. Each is a great man, and each should be revered for who he was and what he did. Even if Aristotle spoke to the Founding generation, he did so very, very softly and only in side whispers and rumors as if by the child’s game of “telephone.” But, when the many voices of antiquity speak to the Founders, they do so never as members of an esoteric sect in which knowledge is passed down as by apostolic succession or in a way that would force the reader to “read between the lines.” Instead, the ancients spoke to the Founders as members of a choir, proclaiming openly the most beautiful of truths in the harmony of a symphony. **A lecture by Brad Birzer given September 14, 2012, Hillsdale College. Part of a Symposium, sponsored by Rachel Kalthoff and Nate Schlueter. Could it be that part of the lack of Aristotelianism is explained by the minimal Roman Catholic presence at the founding? I am thinking of the Aristotelianism of Aquinas. Is there any mention of Aquinas in the Founders' writings? Thomas Jefferson wrote to Henry Lee (May 8, 1825) = Writings (1984) 1501, denying an original contribution to the Declaration: “It was intended to be an expression of the American mind….All its authority rests then on the harmonizing sentiments of the day, whether expressed in conversation, in letters, printed essays, or in the elementary books of public right, as Aristotle, Cicero, Locke, Sidney, &c.” (“Harmonizing sentiments” means more or less what we mean by “consensus.”) Jefferson’s memory is confirmed by earlier writers. Professor Birzer denies the Founders were influenced significantly or directly by Aristotle. Jefferson and Adams, Founders who served on the committee that prepared the first draft of the Declaration of Independence, both say they were. Thomas Hobbes finds this influence on Whigs a century earlier. How can Professor Birzer be right and Jefferson and Adams be wrong about what influenced the Founders? This is a sincere question. If we cannot explain that influence, that is our problem. Like Socrates, I love being refuted, although in this case it will involve refuting Adams and Jefferson about themselves. Chris, thanks so much for replying. I just reposted this piece at the CU CTP before realizing you’d commented. Strange things in the air, I suppose. I am and have been wrestling with your questions for a while now. When I first gave this talk, my Straussian colleagues offered the same challenge. It is more than possible that to make my point, I overstated the case. Still, that Jefferson mentions Aristotle ONLY four times in his entire body of correspondence seems telling to me, especially when three of the four times are either pro-slavery or dismissive. Would it be fair to state that the Founders looks far more to the Romans than the Greeks? At least, that’s what I’m finding. This is a good speech, because it is so clear that it is possible to formulate clear questions in response. I asked, implicitly, why did Jefferson, Adams and Hobbes falsely claim that Aristotle was a significant part of the “one worthy tradition, the tradition of liberty,” as Carl Richard called it, “the doctrines of civil liberty,” in Jonathan Mayhew’s words. Garry Wills had an answer. Jefferson lied. He was really influenced by the contemporary Scottish Enlightenment, but falsely claimed he had read Locke. One of Wills’ arguments is Jefferson’s “crediting Aristotle (of all people!) with formation of the background for his Declaration.” (Inventing America, p. 174). For Wills this claim is so obviously false—nay ludicrous—that it does not require an argument. Even Wills does not explain WHY Jefferson, Adams, Hobbes et al. misstated the case. One argument THAT they lied or misspoke or whatever is Lutz’s article. He counted explicit references. Montesquieu comes close to the top. Then one reads Montesquieu and sees the pervasive presence of the classics. He reformulated in modern terms and eloquent French Whig ideas that go back to the ancients. The whole notion of evaluating the quality of pervasive and fundamental influence by counting references is the fundamental mistake of “social scientists.” When their error is pointed out, they have the gall to accuse the Humanist of “cherry picking” the evidence, because he is evaluating and judging, that is, thinking critically about the evidence. So we return to the question. If what Jefferson, Adams, Hobbes et al. said about Aristotle’s place in the “one worthy tradition of liberty” is false, why did they say it?